The cost of new affordable housing has been a topic of intense scrutiny recently as the need for affordable housing across Oregon continues to significantly outpace the current system's ability to deliver additional units. Many people have questioned why costs for publicly subsidized affordable projects are as high as they are, and whether there are ways to significantly reduce the cost of new affordable housing. Meyer Memorial Trust convened the Cost Efficiencies Work Group to answer questions like these. 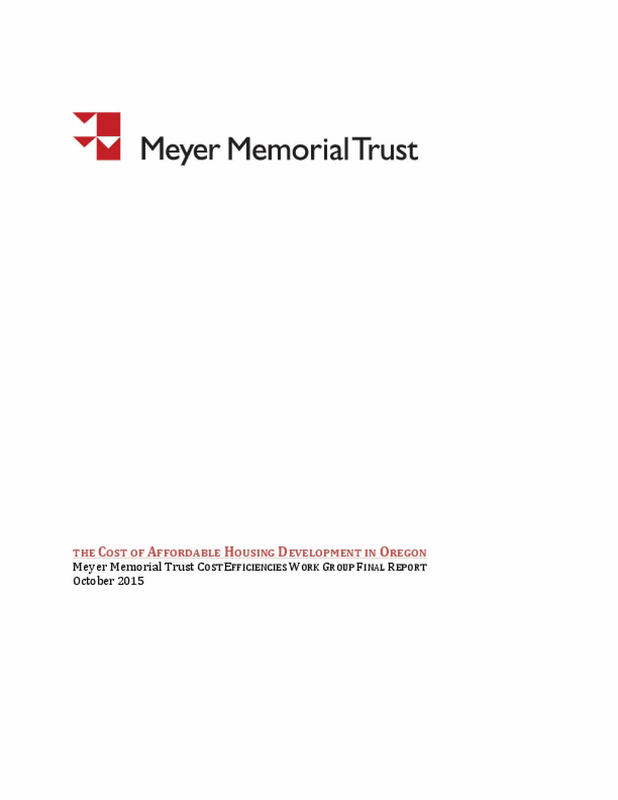 Meyer recruited sixteen experts from development, construction, finance, and related fields and charged this Work Group with three major tasks: 1) To create a clear and concise summary of key factors affecting the cost of developing affordable housing; 2) To identify opportunities – whether policy and systems changes, or innovative approaches to design, construction, and financing – to deliver affordable units at a lower cost; and 3) To advise Meyer on pilot or demonstration projects to test new approaches to affordable housing development. This report synthesizes the results of this work over the last year. The full report engages a wide variety of topics in detail – and the details and nuances are important – but the key results are summarized below. Copyright 2015 by Meyer Memorial Trust. All rights reserved.